X, the world's first 4th dimension thrill ride, has once again pushed all limits and taken extreme to the next level. This $10 million investment features completely redesigned, sleeker trains and introduces all-new, innovative state-of-the-art visual, audio and sensory effects. X moves from the 4th dimension to the 5th becoming X2! With its 360° rotating seats and head-first, face down drops, X has been one of the most popular thrill rides on the planet. 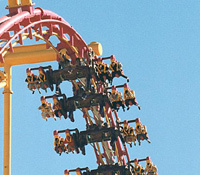 With the redesign, X2 takes you on a journey to a unique and unchartered dimension of extreme only Six Flags Magic Mountain can deliver. Unlike traditional coasters where trains only parallel the track, X2 sends riders screaming around its 3,600-foot maze of steel track aboard massive wing-shaped trains where the seats extend off of the track to the sides of the vehicle, allowing them to independently rotate you head over heels, forward and backward creating a one-of-a-kind "don't know what to expect next" sensation. X2 launches the extreme thrills of X into a new dimension with the addition of a light experience that changes with every ride. Code Corporation designs, develops and manufactures automatic identification and data collection devices, accessories and application enablement systems. 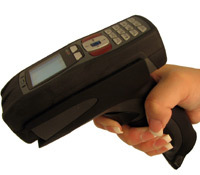 Code's compact portable products provide 'plug and play' input of data from bar codes and advanced 2D symbols. Cordless systems utilize enhanced Bluetooth® radios. Code provides reading and decoding of all open bar code symbologies. While committed to open symbology support, Code also offers its proprietary GoCode® symbology for secured data applications. Code's worldwide headquarters are located in the Salt Lake City, Utah metropolitan area. For more information, go to:www.codecorp.com. G. Boon was founded in 1873 as a carpentry shop in Amsterdam. In 1970 the family business moved from Amsterdam to Edam and the company changed its name to Boon Edam. 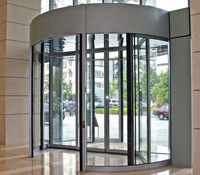 Boon Edam supplied its first revolving door over 100 years ago. Since then the Group has become the acknowledged world market leader in revolving doors and is also now a turnstile manufacturer with the widest range of quality and sophisticated security entrance solutions in the industry, including high security doors and portals. Today our core business focuses on Door Systems, Security Access and Advanced Door Care.